Front o abdomen, shawin the Lairge thairm, wi the stomach an smaa intestine in gray ootline. 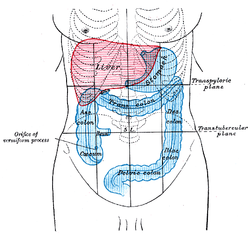 Front o abdomen, shaowin surface markins for liver (reid), an the stomach an lairge thairm (blue). The Lairge Thairm is lik an upside doun U. The lairge thairm is the last pairt o the digeestive seestem in vertebrates. Watter is absorbed here an the remainin waste material is stored as feces afore bein removed bi defecation.